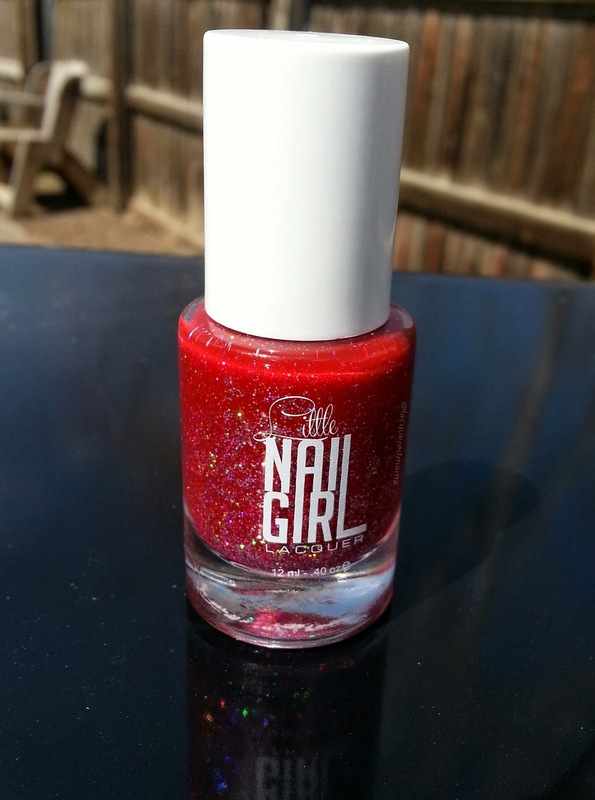 I was super excited when Heather, owner of Littlenailgirl Lacquers, announced that I was one of the lucky girls chosen to be a new beauty blogger for their polish line. Lets just say I was beaming from ear to ear that day! 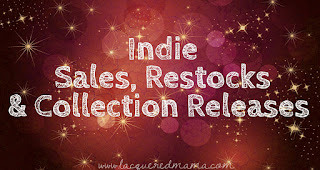 Thank you so much to Heather and the Littlenailgirl team for entrusting your beauties with me! 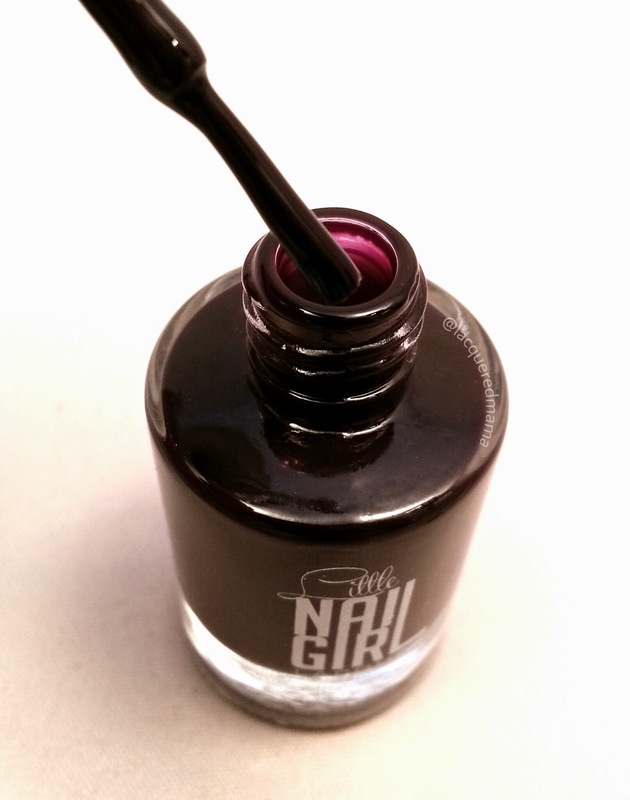 Littlenailgirl Lacquers are made in the USA, Eco & Vegan friendly and are 5 Free. No dibutul phthalate (DBP), toluene, formaldehyde, formaldehyde resin or camphor. Their mission is to offer a clean, safe, professional and affordable product, while keeping up with the latest trends. I have to say, they have hit the nail on the head. I am impressed! Now onto the the swatches and review! First up I have Harley. 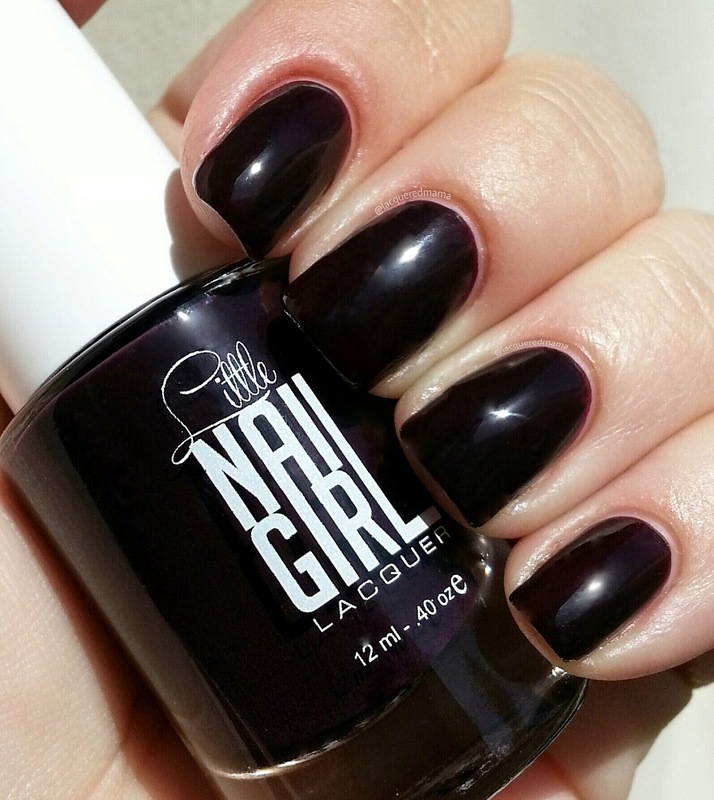 This is an amazingly deep, vampy purple! Gasp! 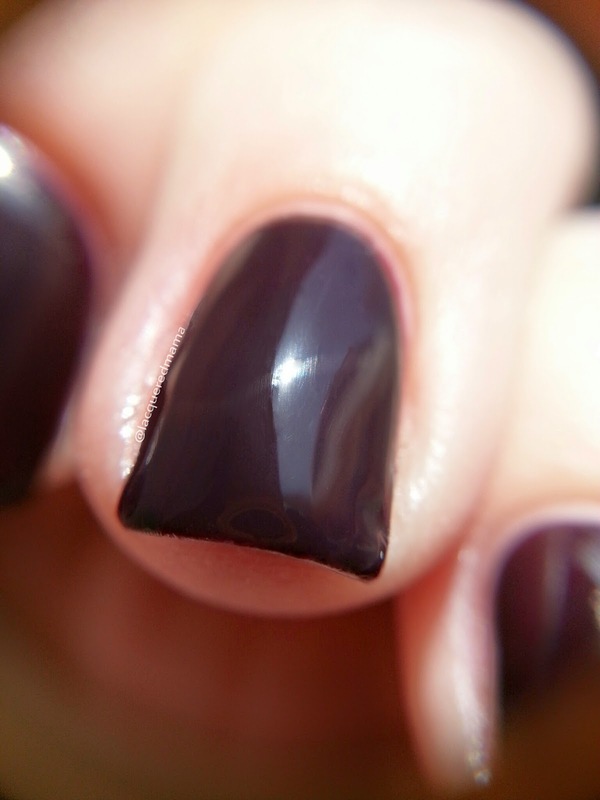 Ahhh I love dark polishes and get this....it is easily a one coater! Don't rub your eyes, you read that right. A ONE COATER! >>> as the skies opened up and light shown down upon my polish bottle! 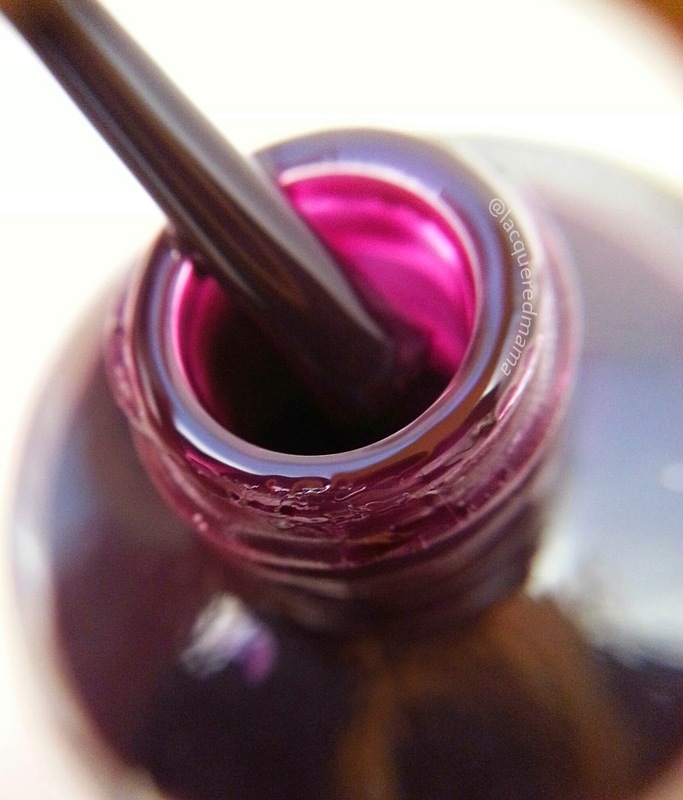 It has an awesomely smooth formula that applied like pudding! (Aha..everyone says butter, so I tried to think of something original. All the pudding I've had is smooth and creamy, so I figured it's the perfect word to describe this polish!) Dry time was like most polishes, not super fast, but not slow either. 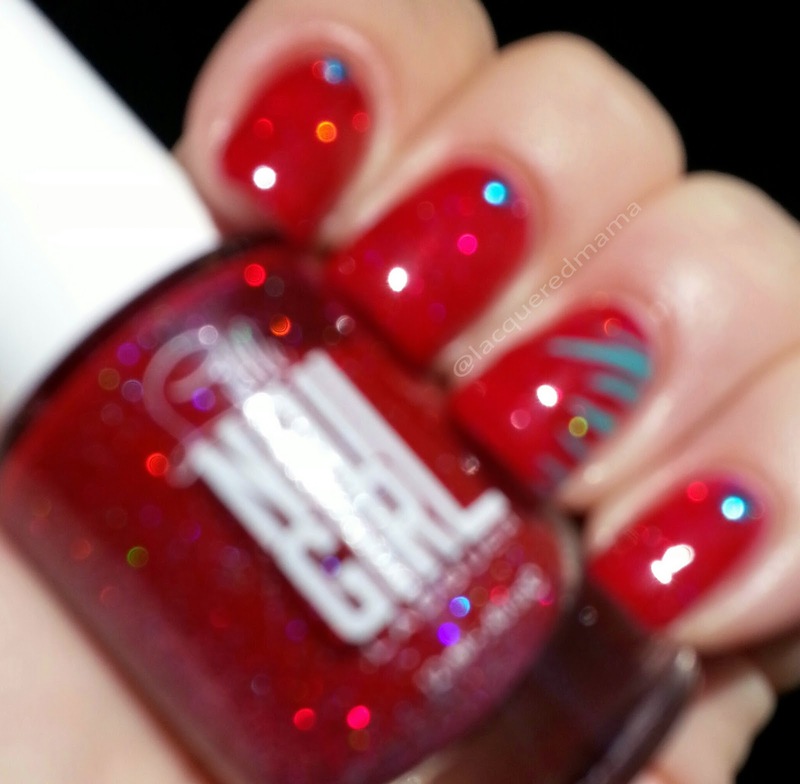 Again, I used 1 coat + HK Girl topcoat by @glistenandglow1! Next up is the stunning Elysa! This one completely reminds me of Dorothy's ruby slippers in the Wizard of Oz. 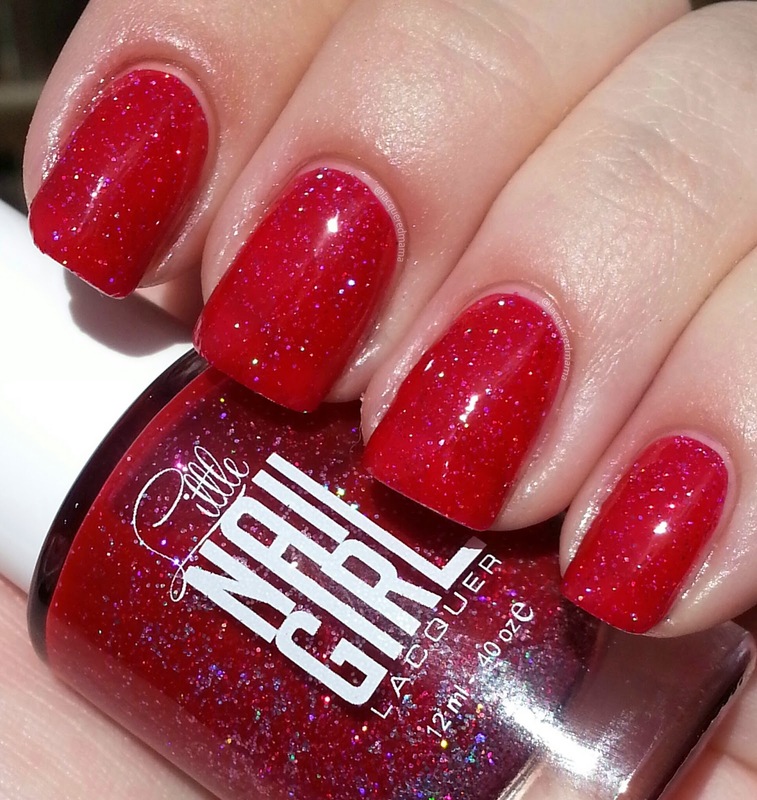 It is a beautiful, bright red glitter polish, that is completely opaque in 2 generous coats. 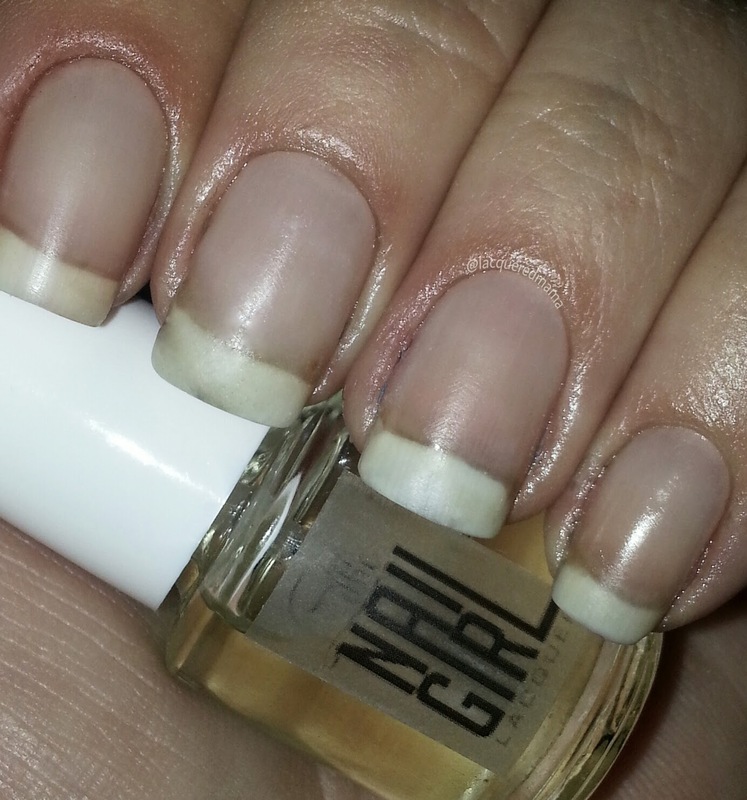 This one is actually almost a 1 coater as well, but it sort of depends on how white the tips of your nails are. Mine are pretty white, so they show through a lot of polishes. Most could get away with 1 generous or 2 lighter coats. 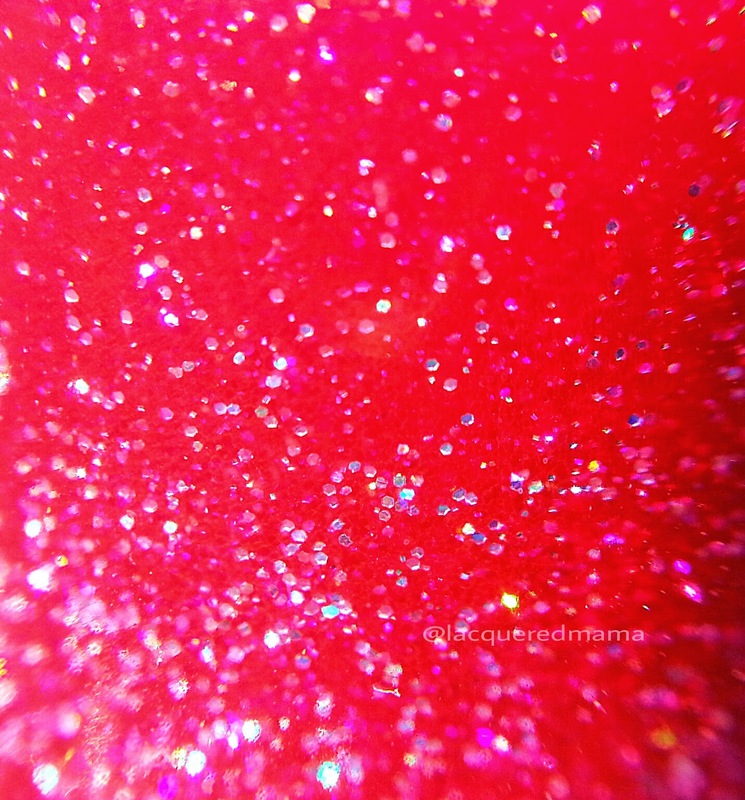 As with most glitter mixes it dries to a visibly rough finish. Two coats of topcoat did the trick to smooth it out completely. Speaking of drying, this one dried surprisingly fast! By the time I was finished with all 5 fingers, the first one was dry enough for its second coat. Again, some of the pictures are in direct sunlight and some in my light box. I also included a blurry sunlight shot, so you could really see how sparkly it is! I kept my nailart very simple, so that it wouldn't take away too much from the actual polish. Again I used acrylic paint and the studs are from Winstonia Store. 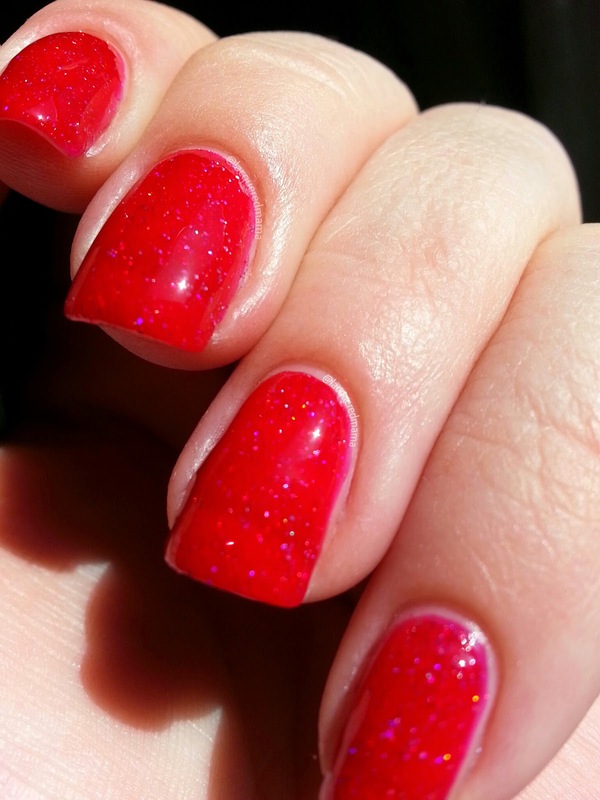 I did 2 generous coats and topped it with two coats of HK Girl topcoat by @glistenandglow1. 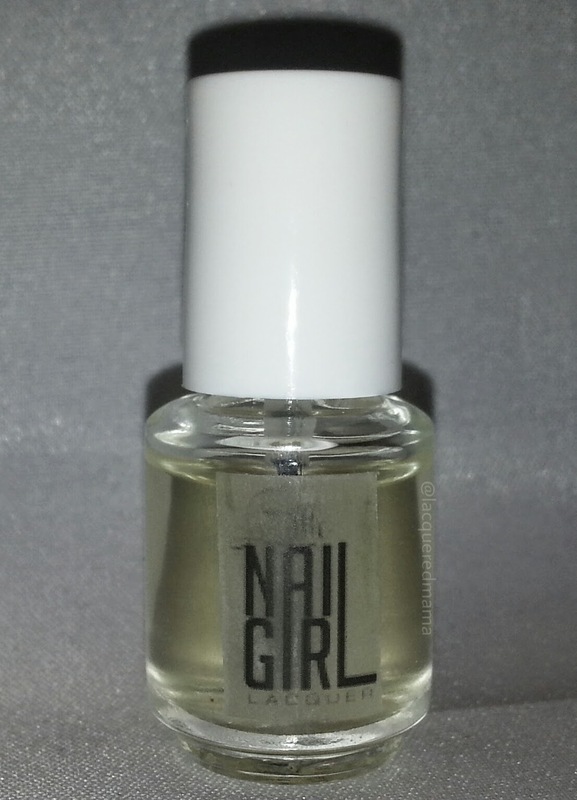 Lastly, Littlenailgirl Lacquers included their Lemongrass Cuticle Oil. I love me some cuticle oils, let me tell you! This one is no exception! It has a really pleasant lemongrass scent. I am very picky about smells, and most perfumey type things make me wanna gag..haha! This doesn't. The smell totally makes we want to just be outside in the sunshine! As much as I enjoyed the smell, I also liked how well it moisturized my cuticles, nails and skin. I put it on my cuticles an let it sit for a few minutes. Then I rubbed it into my nail beds and surrounding skin a bit. It made an immediate difference in all aspects and lasted until I washed my hands about 4hrs later. It is made from a blend of botanical oils and includes vitamin A and calcium. Great stuff! Final thoughts: As stated above I was really impressed by the cuticle oil, as well as the formula consistencies and opacity of both polishes. And the colors are absolutely beautiful too! 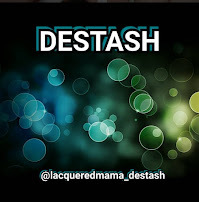 Check out Littlenailgirl Lacquers' shop here for these, and more amazing colors and products.And be sure to follow them on Twitter, Instagram and Facebook for information on new polishes and nail care items. 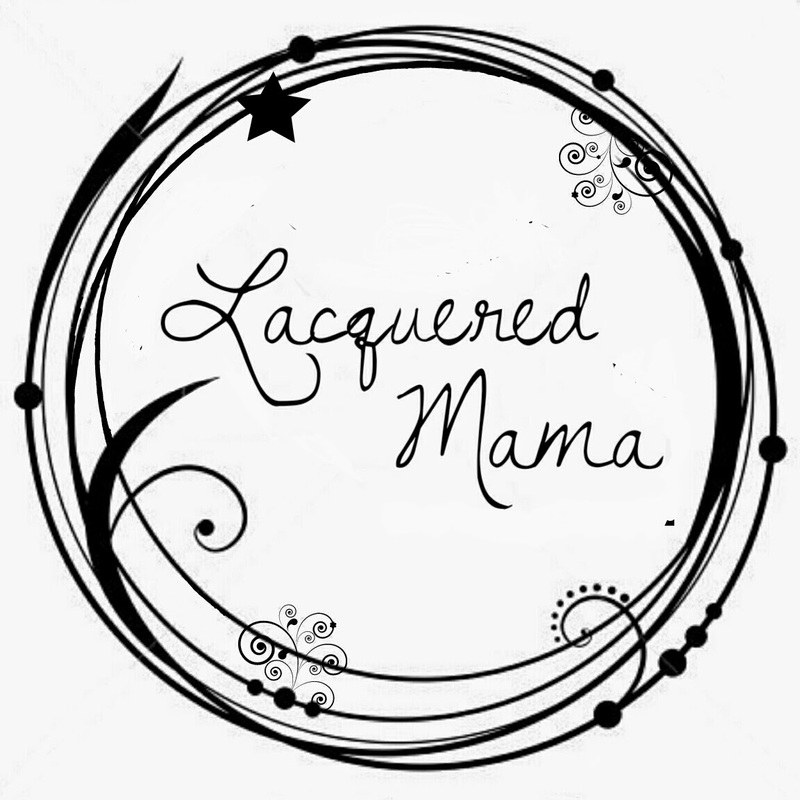 Other social media for LacqueredMama: Instagram, Facebook, Twitter, Pinterest .